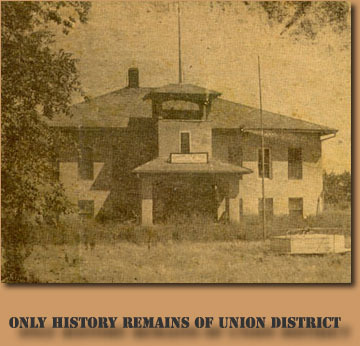 On April 27, 1917, Union Center District 161 was formed. It included the districts of Island Grove Center, Lone Star, Wildcat and Island Grove, covering about 17 sections. On May 17, 1917, the first school board was elected and a meeting was held for discussion of a new school building. On Sept. 26, 1917, a new stucco building, consisting of eight rooms, plus hallways, was opened for first classes. At first it held grades one through 10. The first graduating class was in 1922, consisting of Blanche Emerson Loberg, Frank Blecha and John. Elwood. In the 1930's kindergarten was added. The last graduating class was in 1952; Bob Weins being the only senior. Union Center then contracted with Wymore District 114. On July 1, 1957, Union Center was dissolved and made part of Wymore. When school first opened, transportation was heavy, factory-built horsedrawn hacks, teams driven by older students. Later tin hacks built on spring wagon chassis, built by John Clopper, were used and remained in operation until nearly the time the school closed when the roads were bad. The first motor vehicle used as a school bus was in 1926, a Model T Ford touring car driven by Bob Morris. Buildings around the school consisted of a teacherage and garage, a house and garage for the custodian, and two outhouses. In 1890 church services were conducted in Union Hall, just west of where the school stands. In 1890 the Zion Evangelical Church was built, one mile west of Union Center. A parsonage was built in 1907. At one time membership at the church was over 100. Union Hall was moved and about 1922 a country store was built across the road west of the school. The store did a thriving business, buying cream and eggs, and selling a full line of groceries, gas and oil. While the school was in operation, once a month a community meeting was held at the school. Entertainment consisted of a program either by school students or from some group outside the district. Afterwards, refreshments were served. When the school closed, there were no more community clubs, the church and store closed shortly after and were torn down, and many farm residences and buildings were torn down. Charles Trump, a member of the reunion committee, started with a list of about 740 students and 90 teachers. The whereabouts of about 75 students and 22 teachers remained unknown. Of about 127 graduates, 116 are still living. Of the total students over 100 are deceased. Two hundred seventy are living in Nebraska, 154 in Gage County. Sixty are in California, 37 in Kansas, 30 in Colorado, 22 in Oregon, one in Canada, and one in the Canal Zone. Students have been located in 34 states.